So, you’re venturing out of your warm, fireside blanket-huddle and into the cold, wintery world? Good on ya. The problem is, you hate feeling cold. And well, right now in the upper half of the hemisphere, it’s mostly cold. But now is also the best time for killer deals on flights to Europe and other popular destinations. So you’re going, dang it. 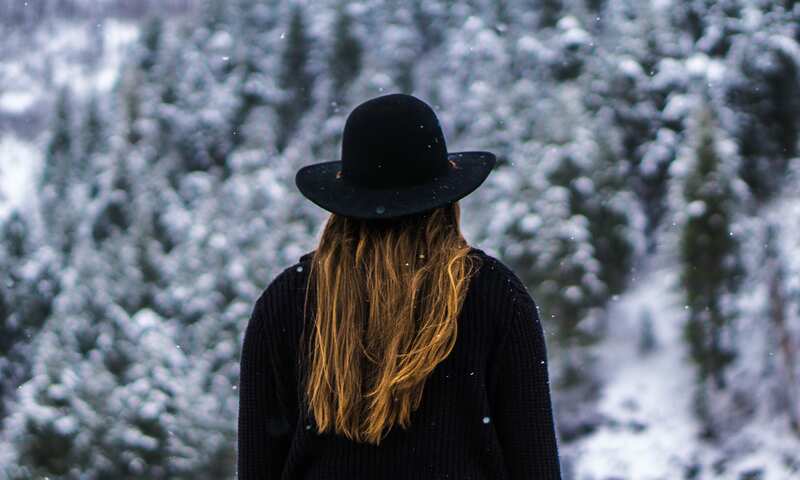 In order for you to stay warm, let me introduce you to your new best friends: the best base layers for cold weather travel. Before you dive into a plethora of killer base layer options for your cold weather travel, a little background on fabric choices is needed. When you’re packing light, consider the fabrics of the clothes you’ll be wearing. Don’t bring linen. While it’s perfect for hot, humid summer days, that very breathability won’t keep you warm in winter. The smallest whisper of a winter breeze will slide right between the fibers. Cotton is a common choice. I’d bet you $20 that if you looked at your favorite traveling clothes, at least 3 pieces of them would be made of cotton. That’s cool. However, on the road with a carry on sized travel backpack, you need clothes that dry fast and resist smells for a long time. Cotton doesn’t do that very well. There’s a better option out there. Merino is ideal because it keeps you toasty warm in the winter, and yet cool in summer. It’s one of the best base layers for winter that money can buy. Speaking of money, the price is its only real downside. For example, Merino wool short sleeve t-shirts can run you $40-80 each. Instead of looking at each shirt as a sunk cost, consider it an investment. Save up for a shirt. Buy a small number of high-quality pieces. Treat them well and they’ll last you a long time. Also, wool fights off odors longer than sweat-wicking performance fabrics. Meaning wool is less costly in terms of total laundry and sunk time costs. According to my economist brother, as he’d crazily number-crunch to prove his point, that’s valuable time wasted doing laundry when you could’ve been out exploring wild new destinations. Maybe you’re wondering: Why are we even talking about layering? And what the heck is it? Layering is the secret to packing light. It’s the trick in bringing more stuff without feeling burdened down by the sheer weight of it. Pick a handful of clothes that play well together, then mix and match them. Layering those clothes keeps you warm on cold days, and you simply shed those layers on hot days. Still having trouble justifying the price of high-quality clothes? Tempted by the glitzy allure of cheap H&M shirts? Think about the cost per wear. Sure, you might pay more up front, but you’ll wear the heck out of your clothes. Long, easy to wash, and super layerable, these Old Navy tank tops are a trifecta of layering perfection. Plus, they’re easy to roll up in your Setout travel backpack and pull triple-duty as a daily tank, sleep shirt, or work-out tank. This shirt isn’t Merino, and it’s not top quality, but it’s budget friendly and will probably last a season. Cue the fangirl freakout over a seemingly simple tank top. Sorry about that, but… I adore this tank top. With a longer-than-normal length and super soft fabric, you will too. Made out of cotton, this tank streamlines those body parts you’re not-so-very-proud-of into one sleek vision of travel adventure. 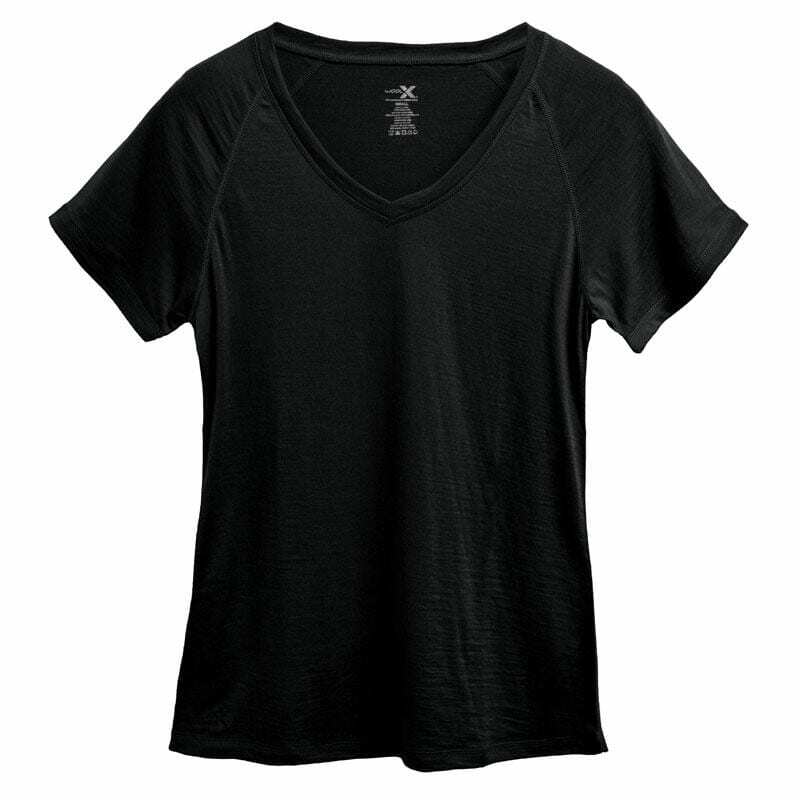 The scoop neck isn’t too low, it layers beautifully, even as the base layer in 3 or more layers. Yeah, I’ve been known to do that on the coldest days. Did you know that silk is naturally insulating? 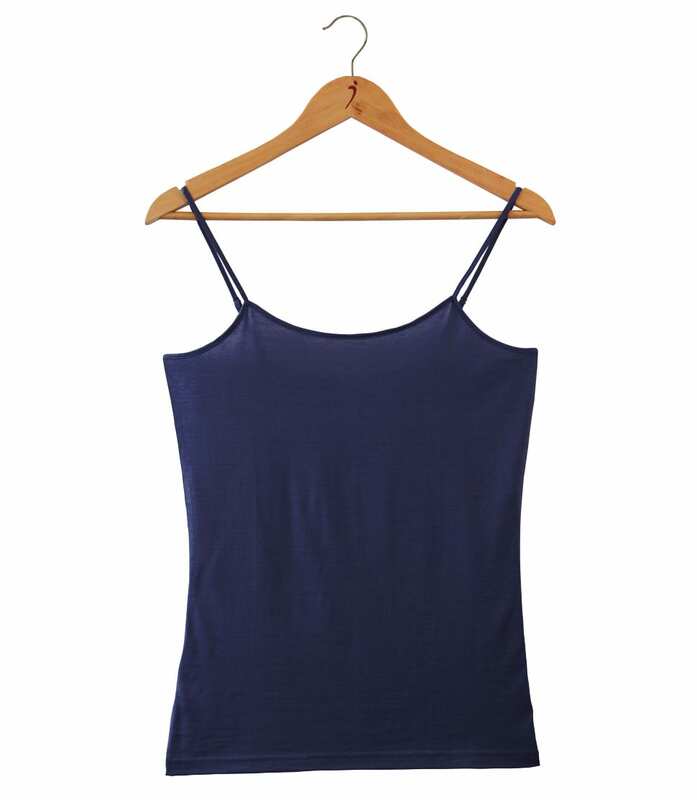 This long camisole blends silk, cotton, and Merino wool for a superb, sleek camisole. It’s longer than normal, so say buh-bye to stray breezes sneaking up your back. As a base layer, it kept me warm on chilly Colorado days designed for skiing. And it feels so luxurious. Bonus: going on day 30 of no-washings,it still passes the sniff test — despite hanging out on my floor for a couple days near smelly boy dogs, within grasp of sticky toddler fingers, and being worn at least 7 consecutive days. One caveat: this is meant as a base layer, so sizing is tight. It might fit a bit smaller than you expect. Yes, yes, I know. I just presented an argument against “cheap, disposable goods.” But, I’ve own several Target vintage tees over the years and they’re not disposable. These T’s are surprisingly long-lasting. With more washings, they get more comfortable a la your more-pricey J. Crew shirts but for a fraction of the price. Softer with every washing, flattering, and responsibly made. Oh, and did you notice the awesome, respect-your-wallet price? I’ve owned this particular Everlane shirt for three years now. Hands down, it’s my favorite one to fly in. No scratchy spots, uncomfortable tightness — just light and free. Perfect for snoozing in or watching Italian fields pass by your train window. Tag says “hand wash only” but I’ve had luck in throwing this shirt in the washer. A bit on the heavier side, this shirt works really well under heavier long-sleeve shirts, blazers, or cardigans. I love this top because it’s ultra-soft, perfect amount of stretch (without feeling like a stuffed sausage) to hide any flaws. 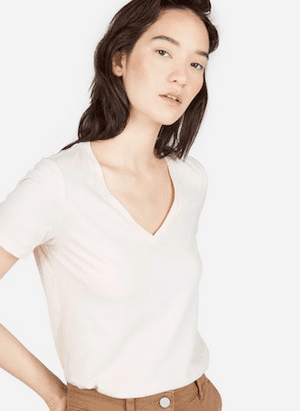 This t-shirt is lighter than Everlane’s cotton v-shirt, so you can easily layer under other shirts. I promise you — this gorgeous shirt will work under any other shirt in your Outbreaker travel backpack or closet. It’s a team player for layering goodness. Oh my, this shirt. It’s soft — silky even — and drapes well. My favorite part? It’s long. As a tall girl, I’m forever perfecting my layering skills on a daily basis by sticking tanks under too-short shirts. Woolx dialled down perfection in this shirt. 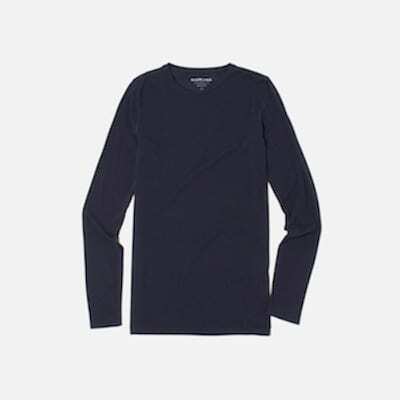 Light enough to layer beautifully, and, thanks to its 100% Merino wool composition, no stink. This is day 30 of it escaping a bath, being thrown on the floor, folded away in my drawer, worn consecutively for 5 days (two of which were in the high 60s) and it smells fresh. Clean, even. Try to pry this t-shirt out of my cold, dead hands. I dare you. Crafted with the same soft cotton as their short sleeve t-shirts, I like this Target long-sleeve shirt to layer under cardigans. 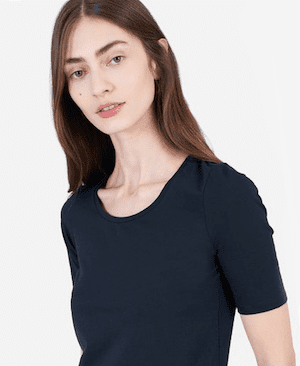 Because it’s cotton, weight is a little heavier than, say, the Everlane Stretch shirt (below). I hunted for my favorite long-sleeve Gap shirt (a supersoft crew) to share with you, but alas, it was nowhere to be found. This long-sleeve crew was the closest I could find. This one is soft and comfy with a slim fit that’s ideal for layering. It’s a solid mid-range option that comes in several colors. The arms are long enough. You know how much that matters. Can I tell you something? I’m wearing this shirt right now. Silky smooth and comfortable against my skin. It’s also going on day 30 of no washings — for you, my dear readers, I’ll do anything, including not doing my laundry for a month — and it still smells fresh. Even though it’s not Merino wool. Instead of my usual medium, I got a large to add in extra space for movement.